InVite is a permission-based way to connect with homeowners using email. InVite is included with PRO subscription plan. InVite is available in our Web app and our iPhone mobile app. Android coming soon. With InVite, now you can connect with your best potential customers by email. InVite is the latest compliment to the many channels you can use to get connected… In-person, by mail, phone, social, and now, email, using InVite. Just like phone and social, we don’t have an email address for every contact. When we do have an email address for a contact, you will see a link to InVite, in the Property & Owner Profile, under the Contacts tab, in the contact information fields. Click "Send Email Invite", and you will be prompted to compose an invitation to connect. A great subject line, with a well written, meaningful message, gets response. Take the time to think about how best to get their attention. Test your message with your friends and peers. Would you respond to your own message? Every experienced direct marketer will tell you that your invitation to connect is first and foremost, just that: Establishing a permission-based connection open for conversation. Don’t try to close a deal, make a sale, or lay it on too thick with your invitation to connect. Keep it short and make them curious. Too much information is a turn-off. When done composing, your InVite message is sent to the contact's email address. 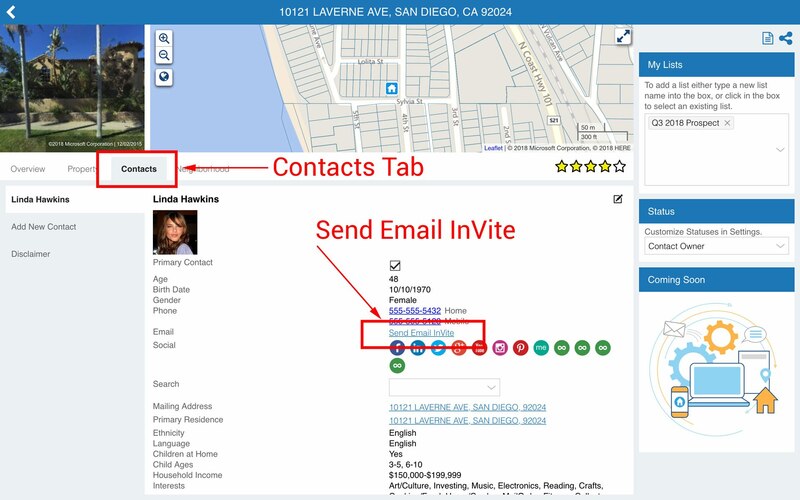 If the contact opens your InVite, reads your message, and chooses to accept your invitation to connect, that contact’s email address will be revealed to you in the Contact information tab. The contact can also reply to your InVite directly. The reply-to address for your InVite uses your name and email address from your PropertyRadar Settings. Not everyone will be eager to connect. If your InVite is not of interest, the contact can choose to Decline your InVite to connect. And that’s OK.
You still try in-person, by mail, over the phone, or connecting via a social network. Or move on to your next prospect. You will receive an email when a contact chooses to decline, accept, or replies directly back to you. If they reply directly back to you without clicking [Accept], you will now have their email address. If your message is spammy or scammy, the owner you are attempting to connect with can report your InVite as abuse. We review every abuse instance and in cases where the abuse is a violation of our Terms of Service, access to InVite or the PropertyRadar service may be terminated. To add that email address to the contact in their Property and Owner Profile, simply edit the contact under the Contact tab and add the email address. InVite, like phone and social contact information, is available to PropertyRadar PRO subscribers.